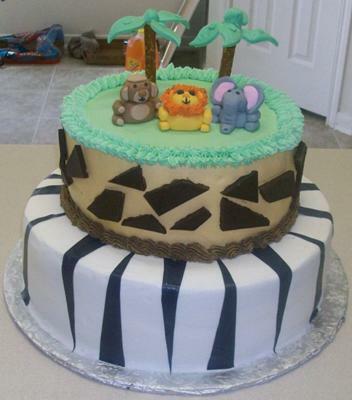 I received a call from a client to recreate a safari themed cake she saw on the internet. The cake she emailed was created in fondant and I recreated it in buttercream with the exception of the animals and the palm tree leaves. The cake has two tiers with the bottom tier vanilla and the top tier chocolate. I made the bear, lion and elephant out of fondant. I could not find my grass tip so I used tip 21 to create a grass look around the top border. I cut up and placed on the top tier. The palm trees were made out of pretzel sticks and fondant leaves.